No Drama Obama is a message that goes to the heart of Michelle Obama's East Wing, even more so than the West. Worldwide attention focuses each time Malia & Sasha make a sanctioned or official appearance. Imagine being a child star without all the Secret Service protection with a humongous house you need an invitation and background check to enter plus having parents that are two of the most famous people on the planet alongside a public desperate to learn more about your every ordinary second of doing homework or being yelled at for forgetting to make your bed. Imagine the hyperventilating as the Obama girls made not one, but three appearances in the same week; Easter Sunday at church, Easter Monday particiapting in the Egg Roll and Story Time, then walking their long-awaited puppy, Bo, for the press with Mom & Dad. the attention is not just from adults but a real fascination from kids of all ages across the globe. The only thing between paparazzi frenzy and media meltdowns on presidential kids is the press operation run out of the East Wing. Jackie Kennedy was a tigress about ensuring she knew which photographs of her children would be used and when - if ever. So much so, that the president had to wait until she was off on a trip, brought the kids into the Oval Office to play and quickly summoned a White House photographer, then released the now iconic pictures. The images of Amy Carter being flashbulbed into blindness before another subsequent traumatic moment of then walking into a room full of classmates where she had not one friend is something every new first lady now remembers. Good thing she had almost forty teddy bears in her room to help comfort her. First Lady Hillary Clinton made it clear her daughter was off limits and publicly ripped SNL for their Chelsea portrayal as an awkward tween against the charms of the Gore girls. Presidential children often have their place of refuge being inside the White House residence. Those 18 acres can feel kind of cut off from reality but swimming in History. The Kennedy children, the Bush twins - Jenna & Barbara, Amy Carter, now Malia and Sasha go to sleep in the same East & West Bedrooms with the famed hallway or Closet Hall window that overlooks the North lawn from where President Lincoln gave his final speech, separating their bedrooms. The Bush twins endured through their grandfather's and their dad's presidencies. Nancy Reagan kept her office and closet in those rooms during her reign. That area is sacrosanct from the press unless invited. But it doesn't stop a press corps from asking questions on what designer the Obama girls are wearing doing which activities and what Mom chose to do and wear. Even the introduction of the dog was a production that got upended by last minute changes to the Bo rollout. Inside the East Wing are political combat professionals holding the line on invasions of the family's privacy under the command of the First Lady. But what do you do when the kids insist on being part of it all? Michelle Obama's star turn in Europe's rarefied stratosphere is going to make it even harder as the presidential summer travel schedule is custom made for a real family educational opportunity. That's the tough thing, the opporunity is now and not when they are older. That first magical state dinner when a King or Queen or president visits will entice the girls to watch either from the residence or sneak a spot at the top of the stairs as the Marine Band strikes up Ruffles and Flourishes. Amy Carter attended a state dinner or two with a book to keep her company. In this day and age, the attraction of watching this First Family's every move is now big business. The East Wing is setting the rules though, same as always. 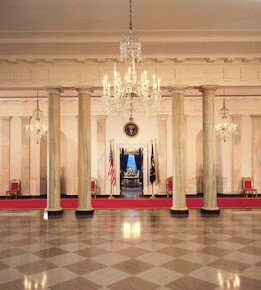 As a small person, the East Wing and its role in White House living, past and present, were cause for great fascination. Flaming Punch is my claim to family social fame at special events. Seeing State events on such a grand scale made me find out how was the magic perfectly performed. It means I read a ton of stuff most people zoom past. This is my chance to share with the one or two people who might stop by EWR. Welcome & Come Back! One of my favorite geeks of History and White House lore is Maureen. I am pleased to have her as an EWR contributor who will no doubt be thought provoking, even though she has had no formal introductions to cake pans or rolling pins. If you enjoy the posts please leave us a comment. 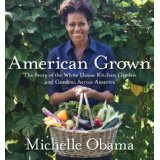 This isThe Story of the White House Kitchen Garden as it developed in March 2009 to the international sensation it is today. The first lady is focused on health and fitness! Get your copy today! It would help us very much! This work is licensed under a Creative Commons Attribution Noncommercial Share Alike 3.0 Unported License.